Standort: 2.2.1.4.20: Part.phys. 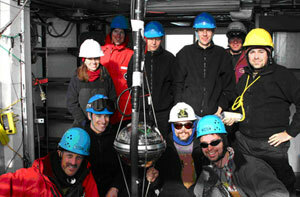 16.02. .
IceCube installation team with DESY members Bernhard Voigt (2nd from left) und Holger Leich (5th from left). With the last plane leaving the South Pole, the season for the IceCube installation ended on February 15. In this Antarctic summer it was possible – after initial obstacles – to deploy eight “IceCube strings” in 2450-meter-deep holes, each one equipped with 60 photomultipliers. With these measuring devices it will be possible to map neutrino interactions in the Antarctic ice. Moreover, 24 so called IceTop tanks were installed that are used to measure air-shower particles. Particularly in the weeks before the end of the season, the drilling and installation speed reached a rate that is necessary for the scheduled installation of 14 to 16 photomultiplier strings per season. This is a great success! already now achieves a duplication of sensitivity.